Good news Nexus lovers! 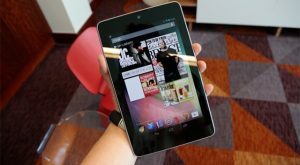 Through February 14, 2012, you can get a $100 AT&T bill credit when you buy a Nexus 7 and sign a 2 year service agreement. This deal is good on the 32GB variant of the Nexus 7 with HSPA+ on AT&T. The current minimum data plan on AT&T will run you $15/month. So if you’re looking for a quick way to save $100, this is not it. Those monthly data charges will add up over the next 2 years. However, the Nexus 7 is a great tablet and having a mobile data plan makes it worth much more than $15/month. On a side note, is this a good indicator that Google is preparing more new Nexus devices and slashing prices on current products? Would you buy a Nexus 7 tablet with a 2 year contract? Or would you rather use your phone’s hotspot feature to get internet on your tablet?Let us know in the comments below.